A leading UK professor has defended a major World Health Organisation (WHO) agency that has been ‘vilified’ by industry lobbyists after it determined the pesticide glyphosate to be ‘probably carcinogenic’ to humans. 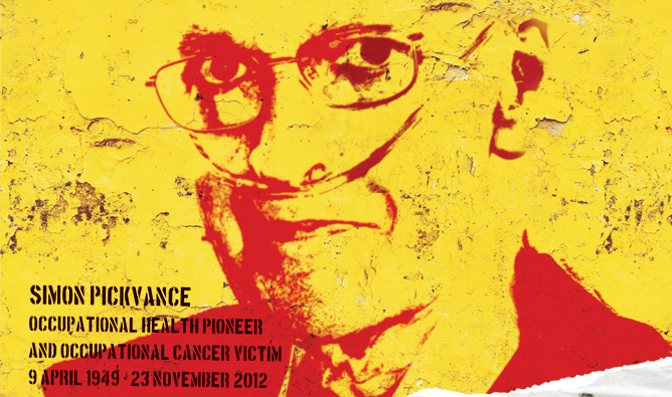 In an expert opinion on the well-resourced, high level industry attack on the International Agency for Research on Cancer (IARC), Neil Pearce, a professor at the London School of Hygiene and Tropical Medicine (LSHTM), said: “Disappointingly, but perhaps not surprisingly, this controversy has led to attacks not only on the IARC decision, but also on some of those involved in the IARC Monograph meeting which made the decision, and on IARC itself. The professor added: “We all look up to IARC and see it as a beacon of independence and objectivity in a world which is becoming increasingly partisan and polarised, and in which scientific evidence is increasingly disparaged and ignored. Facts matter, science matters, and in this field, there is no other agency which even comes close to IARC in terms of independence, objectivity, and transparency. A California jury has found Monsanto guilty of concealing the dangers of glyphosate, the world’s most widely-applied herbicide, and awarded a terminally ill schools groundskeeper total damages of US$289 million. The unprecedented 10 August 2018 verdict delivered by the San Francisco, California jury in favour of Dewayne Johnson, 46, will weigh heavily on the more than 4,000 similar cases already lodged in the US alleging a glyphosate link to the blood cancer non-Hodgkin’s lymphoma. Monsanto has announced it will appeal. Prior to Monsanto’s acquisition by Bayer, the company had set aside US$258 million for litigation; Bayer had a fund of US$447 million. 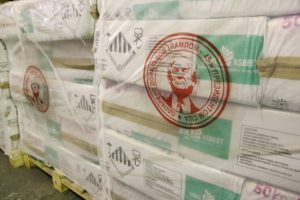 Based on the substantial number of internal company documents made public for the first time as part of the trial process, the jury determined that Monsanto knew of the potential health risks associated with glyphosate exposure yet acted with “malice or oppression” in failing to warn the public. The company papers chronicle a protracted campaign by Monsanto to discredit independent research, capture regulatory bodies and defund the World Health Organisation’s International Agency for Research on Cancer (IARC), which in 2016 determined glyphosate was probably carcinogenic to humans. Democracy Now. Workweek Radio podcast. The Guardian. Bloomberg News. 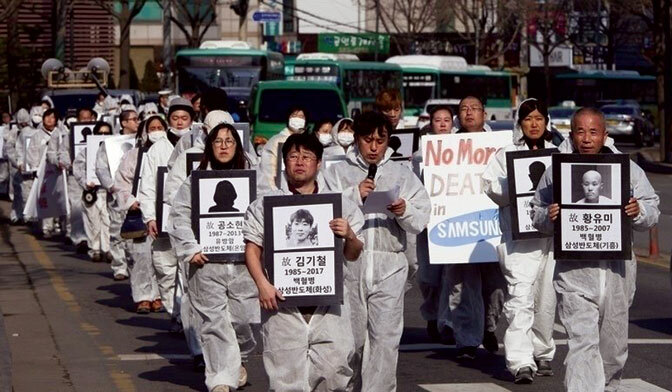 After years of pressure, Samsung Electronics Co Ltd has finally agreed to a binding arbitration framework that calls on the multinational corporation to fully compensate Korean victims of diseases caused by hazardous exposures in its plants. SHARPS, the advocacy group that has spearheaded the campaign for justice for Samsung occupational disease victims and their families, also agreed to the proposal. The group has highlighted work-related conditions including a range of cancers, blood diseases and nervous system disorders in former Samsung production line workers. Samsung effectively walked away from the mediation committee in July 2015, instead launching its own much-criticised compensation programme. This prompted SHARPS to stage a 1,000-day sit-in at its corporate headquarters in south Seoul. On 18 July 2018, the mediation committee made a final proposal for a binding arbitration process, declaring it would dissolve itself if either party did not accept the proposal. This deal, agreed by both sides, means Samsung will begin to put in place safety measures proposed by the mediation committee by October 2018, by when the electronics multinational will also make a formal apology for the harm it has caused. Samsung will also compensate SHARPS-profiled victims under a new scheme proposed by the committee by October 2018. The compensation scheme will remain open for further referrals for ten years. SHARPS agreed to end its sit-in within days of the formal signing of the proposal for arbitration. It announced the 1,023-day protest had ended on 25 June 2018. “We began the sit-in with two desperate tasks in mind,” said SHARPS in a statement after signing the agreement. “First, we needed to make the world know Samsung’s occupational disease issue was still ongoing, and second, we needed to have discontinued dialogue with Samsung re-initiated. The company has faced sharp criticism in the international press over its treatment of occupational disease victims. “Samsung has been bent solely upon shirking its responsibility,” noted an editorial in the Hankyoreh newspaper. As of June 2018, SHARPS had profiled 320 Samsung occupational disease victims in Korea, 118 of whom have died. The advocacy group has, via petition or through court filings, successfully assisted 28 victims of Samsung and others in getting workers’ compensation. Among the cancer types compensated to date are leukaemia, lymphoma and ovarian, brain and lung cancers. More on hazards at Samsung and in the global electronics industry. As evidence establishes occupational exposures are responsible for a substantial proportion of all cancers, studies to identify the groups at risk and the substances causing problems are drying up, top occupational cancer experts have warned. Four papers in the August 2018 issue of the journal Occupational and Environmental Medicine highlight a problem that could ‘stall’ efforts to reduce the burden of occupational cancer, they say. A study led by Claire Marant Micallef identified 94 ‘pairings’ of occupational exposures with cancer sites, but for almost a quarter of these (21) too few studies had been done to determine what proportion of these cancers are related to work. The study by Dana Loomis and his co-authors identified 23 different cancer types associated with workplace exposures, and 12 occupational agents associated with more than one cancer. James Jung and his team noted that while it was possible to identify occupational associations, analyses based on job titles and industries were often too broad to make an accurate quantification of the extent of the risk to those in the precise jobs experiencing the carcinogenic exposures. Flight attendants have a higher prevalence of several forms of cancer, including breast cancer, uterine cancer, gastrointestinal cancer, thyroid cancer and cervical cancer, compared with the general public, according to new research. The large scale study from Harvard University’s TH Chan School of Public Health is the first to show that flight attendants in the US also have a higher rate of non-melanoma skin cancer than the general population. “Our findings of higher rates of several cancers among flight attendants is striking given the low rates of overweight and smoking in our study population, which highlights the question of what can be done to minimise the adverse exposures and cancers common among cabin crew,” said Irina Mordukhovich, research fellow at Harvard Chan School. Over the course of their careers, flight attendants are regularly exposed to several known and probable carcinogens, including cosmic ionising radiation, disrupted sleep cycles and circadian rhythms, and possible chemical contaminants in the airplane. Moreover, cabin crews are exposed to the largest effective annual ionising radiation dose relative to all other US radiation workers because of both their exposure to and lack of protection from cosmic radiation. The study authors say that despite these known risks, flight attendants have historically been excluded from the legal safety protections typically granted to most other US workers. Limited protections were instituted in 2014, but they don’t include monitoring or regulating radiation exposure. The new findings, published in the journal Environmental Health, are based on a 2014-2015 survey of 5,366 US flight attendants in which they were asked about self-reported health outcomes and symptoms, work experience, personal characteristics, and aviation employment history. The findings suggest that additional efforts should be made in the US to minimise the risk of cancer among flight attendants, including monitoring radiation dose and organising schedules to minimise radiation exposure and circadian rhythm disruption, say the authors. Styrene, a key component for many plastics and synthetic rubber, is “probably carcinogenic to humans”, according to the International Agency for Research on Cancer (IARC). An assessment this year by an IARC expert working group said there was now sufficient evidence to change its cancer rating from group 2B – possibly carcinogenic to humans – to 2A, a probable cause of cancer in humans. Globally, manufacturers produce about 20m tonnes of styrene a year, according to the International Styrene Industry Forum (ISIF). This is used primarily as a monomer in the production of plastics, particularly polystyrene, which accounts for about half of global production. The evidence from human studies – which focused on workers making reinforced plastics – was ‘limited’, said IARC’s monograph working group, in a summary paper published in The Lancet Oncology. The studies did provide “credible evidence that exposure to styrene causes lymphohaematopoietic malignancies”, but there was no way to rule out “confounding, bias or chance.” Animal studies provided “sufficient” evidence of a cancer association. Professor Henrik Kolstad of Aarhus University in Denmark, a member of the IARC working group, said: “The most recent styrene study shows the risk of acute myeloid leukaemia, a rare form of leukaemia, is doubled. Out of the more than 70,000 people included in the research project, we found 25 cases of acute myeloid leukaemia, where you would statistically expect to find 10. Manolis Kogevinas and others. Carcinogenicity of quinoline, styrene, and styrene-7,8-oxide, The Lancet Oncology, volume 19, issue 6, pages 728-729, 2018.